I started installing Ubuntu 11.04 from a thumb drive into my home computer. This installation will be within Windows, as I am not sure if my wife will be happy about the change. 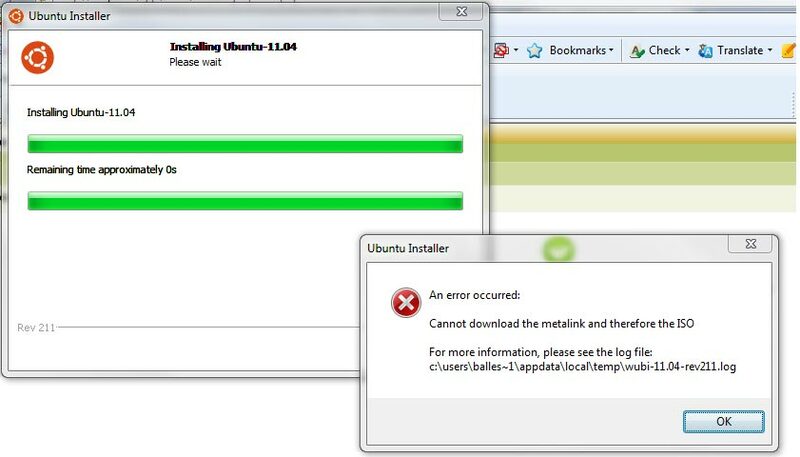 I used wubi as instructed, but came up with this error message: "cannot download the metalink and therefore the ISO". It just might be the Windows XP acting up, I thought, and so I decided to try it at the office computer which runs on Windows 7. Same error message. A bit of research on the web resulted in a solution: place the ISO and wubi in the same folder. And so I created a folder in Desktop which contained the ISO and wubi, and left the thumb drive which contained the system generated by the Universal USB Installer plugged in. I double-clicked wubi and it started reading off the thumb drive. And voila... installation successful! I rebooted and when the system came up again I chose Ubuntu for my OS and it continued its installation. 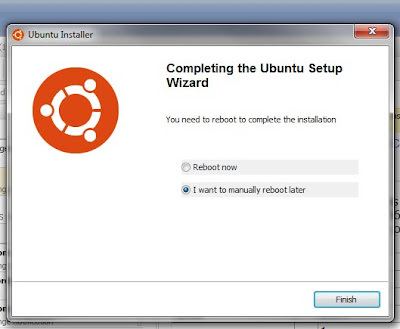 After another reboot, Ubuntu was live! From a novice's point of view, the Unity interface is indeed a bit confusing. For one, I wanted the fonts to be smaller and my screen can display at a higher resolution. I also tried installing Chromium but could not figure out how to do it. At least it's installed now. Will try it at home too so I can play with it a bit more. thanks, quickly solved my problem also! Thanks! same problem is solved! Hi, I tried your solution. It's not working for me when I am installing Ubuntu 11.04 Netbook. So, I searched the internet for a fix. When wubi.exe (rev211) is run standalone, it offers a choice of Ubuntu-Netbook which is no longer available in 11.04 since Unity was made default in Ubuntu. Cannot download the metalink and therefore the ISO. 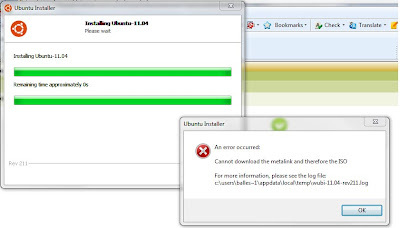 The logfile shows that it attempts to download the metalink for ubuntu-11.04-netbook-i386.iso which does not exist. Hi Dark One. So how exactly was your dilemma solved? What procedure did you follow? It will be great if you can share it also. Thanks.